The Cuban Missile Crisis was a confrontation during the Cold War between the Soviet Union and the United States regarding the Soviet deployment of nuclear missiles in Cuba. The missiles were placed to protect Cuba from attacks by the United States. The placement was rationalized by the Soviets as retaliation for the United States placing deployable nuclear warheads in the United Kingdom, Italy and most significantly, Turkey. 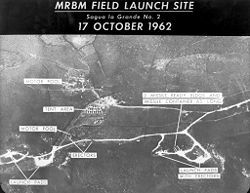 The crisis started on October 16, 1962, when U.S. reconnaissance was shown to U.S. President John F. Kennedy revealing Soviet nuclear missile installations on the island, and ended twelve days later on October 28, 1962, when Soviet leader Nikita Khrushchev announced that the installations would be dismantled. The Cuban Missile Crisis is regarded as the moment when the Cold War came closest to escalating into a nuclear war. Russians refer to the event as the "Caribbean Crisis." Cubans refer to it as the "October Crisis." Fidel Castro took power in Cuba after the Cuban Revolution of 1959. Soon afterwards, he took actions harmful to American trade interests on the island. In response, the U.S. stopped buying Cuban sugar and refused to supply its former trading partner with much needed oil. The U.S. government became increasingly concerned about the new regime. This tension became a major focus of the Kennedy administration when it first took office in January 1961. In Havana, fear erupted that the United States might intervene against the Cuban government. This fear materialized in later 1961 when Cuban exiles, trained by America's CIA, staged an invasion of Cuban territory at the Bay of Pigs. Although the invasion was quickly repulsed, it intensified a buildup of Cuban defense that was already under way. U.S. armed forces then staged Operation Ortsac, a mock invasion of a Caribbean island in 1962. The purpose of the invasion was to overthrow a leader whose name was in fact Castro spelled backwards. Although Ortsac was a fictitious name, Castro soon became convinced that the U.S. was serious about invading Cuba. Shortly after the Bay of Pigs invasion, Castro declared Cuba to be a socialist state and entered close ties with the Soviet Union. This announcement preceded a major upgrade of Cuban military defense. The U.S. had a decided advantage over the Soviet Union in the period leading up to the Cuban Missile Crisis. To Soviet leaders, the missile deployment was a necessary response to desperate military situations. The Soviets had been cornered by a series of remarkable American successes with military equipment and military intelligence. For example, by the close of 1962 the United States had a dramatic advantage in nuclear weapons with more than three hundred land-based intercontinental missiles and a fleet of Polaris missile submarines. The Soviet Union had only four to six land-based ICBMs in 1962, and about one hundred short-range V-1 type missiles that could be launched from surface submarines. Few in Washington seriously believed that a few dozen ballistic missiles in Cuba could change the essential strategic balance of power. The prevailing sentiment in Washington was that the Soviet Union was hopelessly outgunned. By the fall of 1962, America’s arsenal contained three thousand nuclear warheads. Nearly three hundred people were involved in espionage. In 1961 the U.S. started deploying 15 Jupiter IRBM (intermediate-range ballistic missiles) nuclear missiles near Izmir, Turkey, which directly threatened cities in the western sections of the Soviet Union. President Kennedy regarded these missiles as being of questionable strategic value; an SSBN (ballistic submarine) was capable of providing the same cover with both stealth and superior firepower. Soviet Premier Nikita Khrushchev had publicly expressed his anger at the Turkish deployment. He regarded the missiles as a personal affront. The deployment of missiles in Cuba—the first time Soviet missiles were moved outside the USSR—is commonly seen as Khrushchev's direct response to the Turkish missiles. Soviet Medium-Range Ballistic Missiles on Cuban soil, with a range of 2,000 kilometers (1,200 statute miles), could threaten Washington, D.C. and nearly half of the U.S.'s Strategic Air Command bases (of nuclear-armed bombers), with a flight time of under twenty minutes. In addition, the U.S.'s radar warning systems oriented toward the USSR would have provided little warning of a launch from Cuba. Khrushchev devised the deployment plan in May of 1962. By late July, over sixty Soviet ships were en route to Cuba, some of them carrying military material. CIA Director John McCone, had recently been on honeymoon to Paris. While there, he had been told by French Intelligence that the Soviets were planning to place missiles in Cuba. He warned President Kennedy that some of the ships were probably carrying missiles. However, the president, Robert Kennedy, Dean Rusk, and Robert McNamara concluded that the Soviets would not try such a thing. Kennedy's administration had received repeated claims from Soviet diplomats that there were no missiles in Cuba, nor any plans to place any. The Soviets claimed they were not interested in starting an international drama that might impact the U.S. elections in November. A photograph of the San Cristobal MRBM launch site taken from a Lockheed U-2 reconnaissance aircraft. Most people mistakenly believe this image was taken during the Cuban Missile Crisis, when in fact it was taken after the crisis had concluded. A Lockheed U-2 flight in late August photographed a new series of Surface-to-air missile sites being constructed. In spite of this, on September 4, 1962 Kennedy told Congress that there were no offensive missiles in Cuba. On the night of September 8, the first consignment of SS-4 MRBMs was unloaded in Havana. A second shipload arrived on September 16. The Soviets were building nine sites—six for SS-4s and three for SS-5s with a range of 4,000 kilometers (2,400 statute miles). The planned arsenal was forty launchers, an increase in Soviet first strike capacity of 70 percent. This matter was readily noticed by Cubans in Cuba. Perhaps as many as a thousand reports about the missile installations reached Miami. The reports were evaluated and then considered spurious by U.S. intelligence. 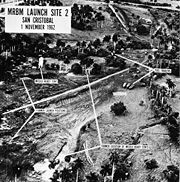 A number of unconnected problems meant that the missiles were not discovered by the U.S. until a U-2 flight on October 14 clearly showed the construction of an SS-4 site near San Cristobal. The photographs were shown to Kennedy on October 16. By October 19 the U-2 flights (then almost continuous) showed four sites were operational. Initially, the U.S. government kept the information secret, telling only the 14 key officials of the executive committee. The United Kingdom was not informed until the evening of October 21. In a televised address on October 22, President Kennedy announced the discovery of the installations. He proclaimed that any nuclear missile attack from Cuba would be regarded as an attack by the Soviet Union and would be responded to accordingly. He also placed a naval "quarantine" (blockade) on Cuba to prevent further Soviet shipments of military weapons from arriving there. He used the word quarantine rather than blockade because of international law (the blockade took place in international waters). In keeping with the Quarantine Speech of 1937 by Franklin Delano Roosevelt, Kennedy reasoned that a blockade would be an act of war (which was correct). War had not been declared between the U.S. and Cuba. A U-2 flight was shot down by an SA-2 Guideline SAM emplacement on October 27, causing increased stress surrounding negotiations between the USSR and the U.S.
With the confirmed photographic evidence of Soviet missile bases in Cuba, President Kennedy convened a secret meeting of a special group of senior advisers at the White House. This group later became known as the ExComm, or Executive Committee of the National Security Council. Beginning the morning of October 16, this group met frequently to devise a response to the threat. An immediate bombing strike was dismissed early on, as was a potentially time-consuming appeal to the United Nations. They eventually rejected a diplomatic solution, narrowing the choice to a naval blockade and an ultimatum, or a full-scale invasion. A blockade was finally chosen, although there were a number of conservatives (notably Paul Nitze, and Generals Curtis LeMay and Maxwell Taylor) who pushed for tougher action. An invasion was planned. Troops were assembled in Florida. However, U.S. intelligence was flawed. Soviet and Cuban troop number estimates on Cuba were around 10,000 and 100,000. They were actually around 43,000 and 270,000 respectively. Also, U.S. intelligence was unaware that 12 kiloton-range nuclear warheads had already been delivered to the island and mounted on FROG-3 "Luna" short-range artillery rockets. These missiles could be launched on the authority of the Soviet commander on the island, Issa Pliyev,  in the event of an invasion. An invasion would probably have precipitated a nuclear strike against the invading force, with catastrophic results. There were a number of issues with the naval blockade. There was the issue of legality. As Fidel Castro noted, there was nothing illegal about the missile installations. They were certainly a threat to the U.S., but similar missiles aimed at the USSR were in place in Europe (60 Thor IRBMs in four squadrons near Nottingham, in the United Kingdom; 30 Jupiter IRBMs in two squadrons near Gioia del Colle, Italy; and 15 Jupiter IRBMs in one squadron near Izmir, Turkey). There was concern of the Soviets’ reaction to the blockade, as it had the potential to turn into escalating retaliation. Kennedy spoke to the American public and the Soviet government in a televised address on October 22. He confirmed the presence of the missiles in Cuba and announced the naval blockade as a quarantine zone of 500 nautical miles (926 kilometers) around the Cuban coast. He warned that the military was "prepared for any eventualities," and condemned the Soviet Union for "secrecy and deception." The U.S. was surprised at the solid support from its European allies, particularly from the notoriously difficult President Charles de Gaulle of France. Nevertheless, the British prime minister, Harold Macmillan—as well as much of the international community—did not understand why a diplomatic solution was not considered. The case was conclusively proved on October 25 at an emergency session of the UN Security Council. U.S. Ambassador Adlai Stevenson attempted to force an answer from Soviet Ambassador Valerian Zorin as to the existence of the weapons, famously demanding, "Don't wait for the translation!" Upon Zorin's refusal, Stevenson produced photographs taken by U.S. surveillance aircraft showing the missile installations in Cuba. Khrushchev sent letters to Kennedy on October 23 and 24 claiming the deterrent nature of the missiles in Cuba and the peaceful intentions of the Soviet Union. However, the Soviets also delivered two different options for resolution to the United States government. On October 26, they offered to withdraw the missiles in return for a U.S. guarantee not to invade Cuba or support any invasion. The second deal was broadcast on public radio on October 27, calling for the withdrawal of U.S. missiles from Turkey in addition to the demands of October 26. The crisis peaked on October 27, when a U-2 was shot down over Cuba, killing pilot Rudolph Anderson, and another U-2 flight over Russia was almost intercepted when it strayed over Siberia. This was after Curtis LeMay (U.S. Air Force chief of staff) had neglected to enforce presidential orders to suspend all over-flights. At the same time, Soviet merchant ships were nearing the quarantine zone. Kennedy responded by publicly accepting the first deal and sending Attorney General Robert Kennedy to the Soviet embassy to accept the second in private. The fifteen Jupiter missiles near Izmir, Turkey would be removed six months later. Kennedy also requested that Khrushchev keep this second compromise out of the public domain. This had ramifications for Khrushchev later. Some accounts downplay the significance of the removal of the missiles in Turkey as something that President Kennedy had already previously ordered due to their obsolescence. The Soviet ships turned back. On October 28, Khrushchev announced that he had ordered the removal of the Soviet missiles in Cuba. The decision prompted then Secretary of State Dean Rusk to comment, "We are eyeball to eyeball, and the other fellow just blinked." Satisfied that the Soviets had removed the missiles, President Kennedy ordered an end to the quarantine of Cuba on November 20. The compromise satisfied no one, but it was a particularly sharp embarrassment for Khrushchev and the Soviet Union because the withdrawal of American missiles from Turkey was not made public. The Soviets were seen as retreating from circumstances that they had started. If it were played well, it could have looked like just the opposite. The USSR gallantly saves the world from nuclear holocaust by not insisting on restoring the nuclear equilibrium. Khrushchev's fall from power two years later can be partially linked to Politburo embarrassment at both Khrushchev's eventual concessions to the U.S. and his ineptitude in precipitating the crisis in the first place. U.S. military commanders were not happy with the result either. General LeMay told the president that it was "the greatest defeat in our history" and that the U.S. should invade immediately. For Cuba, it was a betrayal by the Soviets whom they had trusted, given that the decisions on putting an end to the crisis had been made exclusively by Kennedy and Khrushchev. In early 1992 it was confirmed that key Soviet forces in Cuba had, by the time the crisis broke, received tactical nuclear warheads for their artillery rockets, and IL-28 bombers. General Anatoly Gribkov, part of the Soviet staff responsible for the operation, stated that the local Soviet commander, General Issa Pliyev, had pre-delegated authority to use them if the U.S. had mounted a full-scale invasion of Cuba. Gribkov had misspoken. The Kremlin's authorization remained unsigned and undelivered. Other accounts show that Pliyev was given permission to use tactical nuclear warheads only in the most extreme case of an American invasion during which contact with Moscow is lost. However, when American forces seemed to be readying for an attack (after the U-2 photos, but before Kennedy's television address), Khrushchev rescinded his earlier permission for Pliyev to use the tactical nuclear weapons, even under the most extreme conditions. The Cuban Missile Crisis spurred the creation of the Hot Line, a direct communications link between Moscow and Washington, D.C. The purpose of this undersea line was to have a way the leaders of the two Cold War countries could communicate directly to be better able to solve a crisis like the one in October 1962. Various commentators (Melman 1988, Hersh 1997) suggest that the Cuban Missile Crisis enhanced the hubris of American military planners, leading to military adventurism—most decidedly in Vietnam. This crisis was a substantial aspect of the 2003 Oscar winning documentary, The Fog of War: Eleven Lessons from the Life of Robert S. McNamara. The short time span of the Cuban Missile Crisis and the extensive documentation of the decision-making processes on both sides makes it an excellent case study for analysis of state decision making. In the Essence of Decision, Graham T. Allison and Philip D. Zelikow use the crisis to illustrate multiple approaches to analyzing the actions of the state. In addition, it is an excellent case study for analysis of success in resolving a military-type standoff without resorting to military aggression. In October 2002, McNamara and Schlesinger joined a group of other dignitaries in a "reunion" with Castro in Cuba to continue the release of classified documents and to further study the crisis. It was during the first meeting that Secretary McNamara discovered that Cuba had many more missiles than initially thought. McNamara realized that, Castro and Khruschev, viewed then by the White House inner circle as 'rational men' had been perfectly willing to start a nuclear war over the crisis. It was also revealed at this conference that an officer aboard a Soviet submarine, named Vasili Alexandrovich Arkhipov, may have single-handedly prevented the initiation of a nuclear catastrophe. ↑ National Security Archive. Interview with Sidney Graybeal. Access date: February 20, 2007. ↑ Cold War: Cuban Missile Crisis. Library of Congress. January 4, 1996. Access date: February 20, 2007. ↑ Ferraro, Vincent. Soviet Analysis of the Strategic Situation in Cuba on 22 October 1962. Quoting text from Aleksandr Fursenko and Timothy Naftali. One Hell of a Gamble: Khrushchev, Castro, and Kennedy, 1958-1964. New York: W. W. Norton & Company, 1997. pp. 240-243. ↑ Arms Control Association. Arms Control Today. Access date: February 20, 2007. ↑ Rennie, David. “How Soviet sub officer saved world from nuclear conflict.” Telegraph.co.uk. October 13, 2002. Access date: February 20, 2007. Khrushchev, Sergei. "How my father and President Kennedy saved the world." American Heritage (October 2002). IV. Chronology of Submarine Contact During the Cuban Missile Crisis. October 1, 1962 - November 14, 1962. Prepared by Jeremy Robinson-Leon and William Burr. Declassified Documents, etc. – Provided by the National Security Archive. Forty Years After 13 Days by Robert S. McNamara. History of "Cuban Missile Crisis"
This page was last modified on 24 November 2017, at 20:43.